WWE officially announced this past Monday that Brock Lesnar signed a new contract with WWE. According to Dave Meltzer on the latest edition of Wrestling Observer Radio, the agreement for a new deal was made on the Monday before WrestleMania 34 at the go-home episode of RAW and was signed on Sunday before the match. It’s a new contract, not an extension of his existing deal, and is at a higher rate. Meltzer noted that it’s not known if the new deal is a one-match contract or for more than that. The agreement was kept quiet and very few people knew about it. 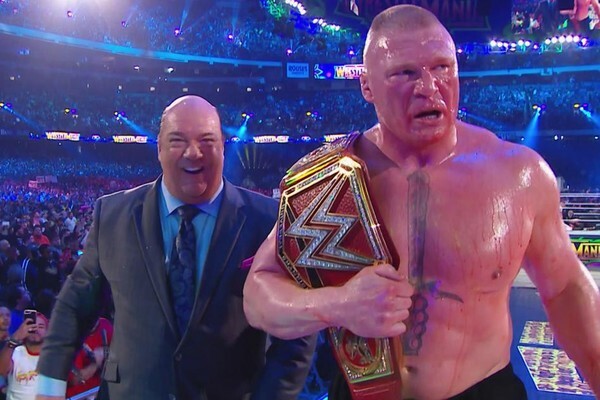 Meltzer stated that Roman Reigns found out about it on the day of WrestleMania, and had thought he would be winning the title from Lesnar up until that point. The original ending was supposed to have Reigns coming off the ropes and get put into an F5, however he would counter it into a spear and pin Lesnar to win the match. It was changed to Lesnar hitting the F5 and beating Reigns. The match went off as planned, and nobody went off-script. It was reported earlier in the week that the new deal allows for Lesnar to fight in the UFC. Obviously, if it’s a one-match contract, then it’s a moot point anyway. Meltzer also noted that Lesnar has yet to re-enter the USADA testing pool. Lesnar was suspended by the USADA for testing positive for a banned substance, estrogen blocker clomiphene, in an out-of-competition test and in-competition test prior to his fight with Mark Hunt at UFC 200 in 2016. Lesnar was suspended for one year by USADA, however the suspension was frozen after Lesnar announced his retirement from MMA. Lesnar still has six months of his suspension to complete once he re-enters the USADA testing pool, so if Lesnar is serious about returning to the UFC, it’s unclear why he has yet to re-enter the pool.